Kershaw Fraxion Folding Pocket Knife (1160) Lightweight, Contemporary 2.75 In. 8Cr13MoV Stainless Steel Blade With G10 Handles, Inset Liner Lock And Reversible Pocket Clip; 1.9 oz. Collaborated between Kershaw and Danish custom knifemaker, Jens Anso, the Fraxion 1160 features innovative technologies, making the knife extremely lightweight and strong. With KVT manual open, users can quickly and easily open the compact folding knife with a pull back on the built-in flipper. Built into slimmer and lighter knives, the insert liner lock safely secures the blade into place while in use and prevents closure. The Fraxion is made of 8Cr13MoV durable stainless steel on the blade and a G10 handle with a BlackWash finish for increased strength and a worn, non-reflective look. The stonewashed, black matte finish helps hide scratches, fingerprints and dirt on the blade, is hard and scratch resistant, and best for cutting tasks. The reversible, deep pocket, four-position pocketclip allows the user to carry the Fraxion tip-up or tip-down, left or right handed, and deep in pockets for additional comfort. The Fraxion is a high quality, slim, sleek knife perfect for EDC. Ideal EDC knife and essential for everyday tasks-cutting, slicing, survival tool, home protection or the perfect gift. Durable 8Cr13MoV stainless steel, clip point blade keeps its sharp edge and strength, is corrosion and wear resistant; features a top swedge and slight recurve to enhance slicing capabilities. G10 handle with BlackWash finish looks broken in, roughened, and scratch resistant best for cutting tasks. 4-position, deep carry, reversible clip allows users to carry tip-up or tip-down, left or right handed. General all-purpose use for daily home needs, hunting, fishing, farming, climbing, camping, hiking, ranching or working. 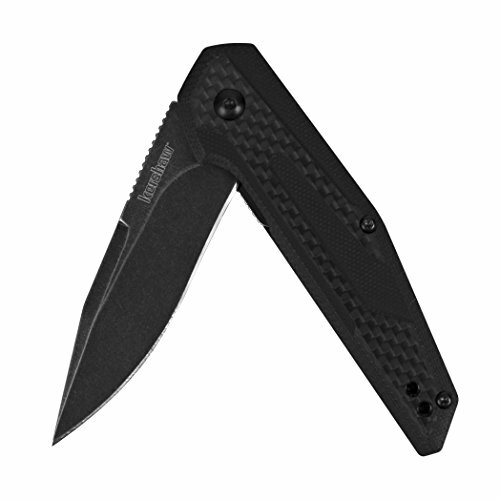 Kershaw Composite BlackWash Leek (1660CBBW) 3-Inch Patented Composite Steel Blade, 410 Stainless Steel Handle, Full-Body Black-Oxide Finish, SpeedSafe Assisted Opening, Frame Lock, Tip-Lock; 3.1 OZ.